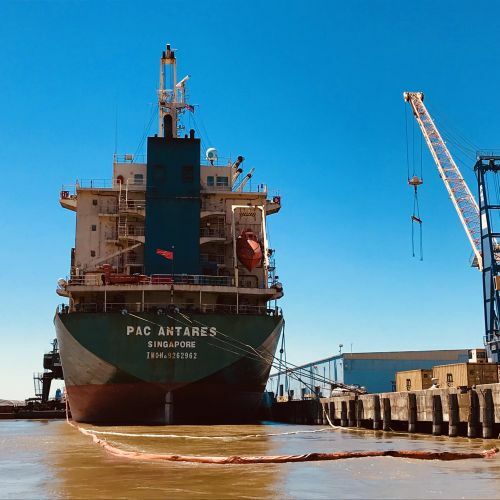 APRIL 17, 2018 — On Thursday, April 12, 2018, the Singapore-flagged vessel Pac Antares struck a wharf on the Mississippi River near New Orleans. The allision punctured one of the ship's fuel tanks resulting in a discharge of heavy fuel oil into the river. Oil along the New Orleans River Walk following a spill that happened Thursday, April 12, 2018. Image credit: U.S. Coast Guard. The initial worst case discharge was 114,000 gallons based on the volume of the tank, but this was later revised to approximately 4,200 gallons. This initial uncertainty in spill volume is fairly common as it takes time to sound the tanks and check engineering and fueling records. 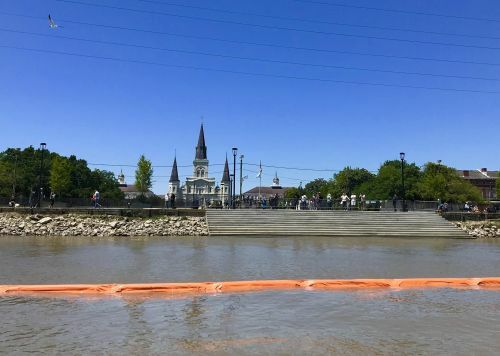 The fuel oil had a high sulfur content, making odors a concern along the river and the New Orleans French Quarter. Approximately 10 miles of the Mississippi River were closed to facilitate cleanup. The river was reopened on Friday, April 13, though shoreline cleanup and decontamination is ongoing. NOAA is supporting the U.S. Coast Guard and the Unified Command, focusing on identifying sensitive areas, forecasting the oil movements and fates, and tracking the cleanup activities. For more information, visit IncidentNews or the U.S. Coast Guard 8th District Heartland News Room. 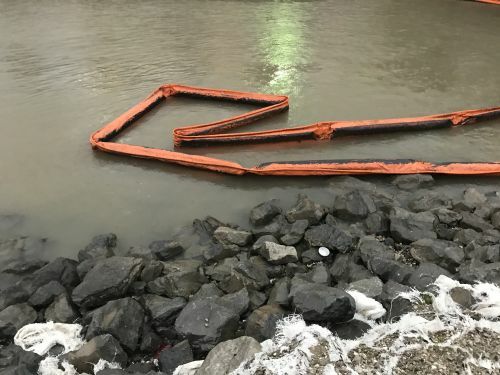 Oiled pollution boom in the Mississippi River following a spill on April 12, 2018. Image credit: NOAA. Oiled steps and rip rap with St. Louis Cathedral and Jackson Square in the background. On Thursday, April 12, 2018, the Singapore-flagged vessel Pac Antares struck a wharf on the Mississippi River near New Orleans resulting in a fuel discharge. Image credit: U.S. Coast Guard.